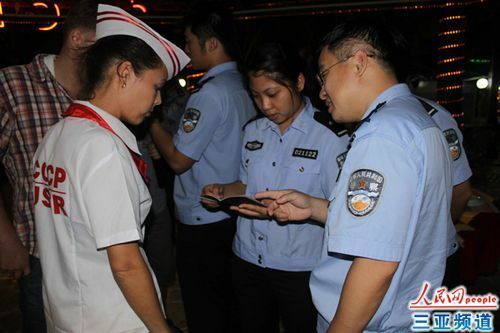 Recently, the Sanya Police Entry and Exit Administrative Department began inspections to combat the "three illegalities" for foreigners: illegal immigration, illegal residence and illegal employment, reports 0898.net. In recent years, a large number of foreigners have been residing in the Dadonghai Area either in rented houses or as tourist guests. However, it is reported that illegal activities of foreigners are sometimes seen in such places. During the clean-up campaign, 7 foreigners were found residing in Dadonghai without carrying their passports and applying for alien registration cards and 1 was detained without a legal residence permit. According to local police, the number of foreigners flocking to Sanya is increasing under the background of development of an International Tourism Island. Relevant departments will work together to renew its efforts on entry investigation to provide a good administration service for foreigners.